What is the average car payment, and what can you afford? With a car payment likely to be one of your highest monthly expenses, it’s important to know what you may be able to afford before financing a vehicle for the next several years. Rising car prices make buying a new vehicle more challenging for many consumers and, along with larger loan amounts and rising interest rates, have contributed to the current trend of higher monthly payments. Average loan amounts are $30,958 for new and $19,708 for used cars, according to Experian data for the second quarter of 2018, and the average car payment is $525 and $378, respectively. So buyers are increasingly turning to longer loan durations to offset these costs and make their payment more affordable. New and used car loans have crept up to 69 and 64 months on average, while some new-car buyers are even taking out loans up to 96 months – a full eight years. Loan amount, interest rate and loan duration are not the only elements that shape the average car payment, however. Factors like down payment and credit score are also significant, and will help you understand what you may afford. 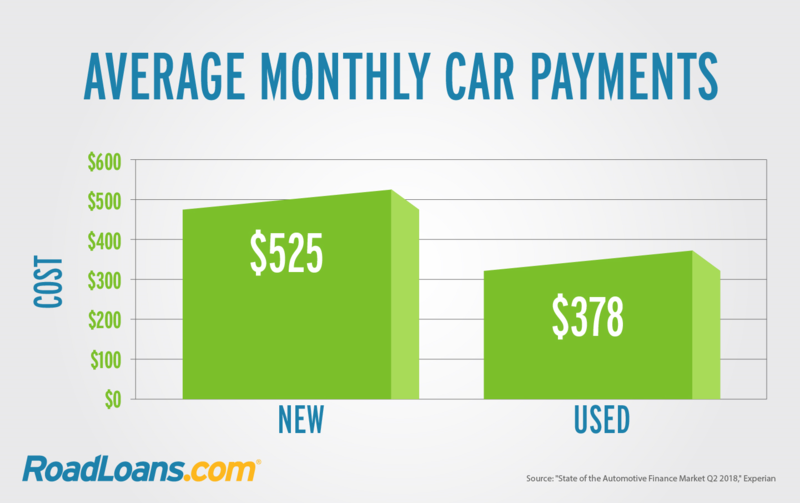 RoadLoans’ auto loan calculator gives an idea of what a potential monthly car payment will be. Enter the loan amount, loan term in months, APR and a down payment, which can include a trade-in if you have one. Then adjust the fields to see how the car payment is affected. Reduce the APR or increase the loan term, or do both, and the payment drops, for example. Credit score plays a large part in what interest rate an approved applicant will receive, and consumers with good credit typically get lower rates than those with bad credit. * Keep in mind a longer loan term may result in more total interest paid by the end of the loan. While many people are primarily concerned with what their monthly payment could be, it’s also important to know the overall cost of a vehicle. 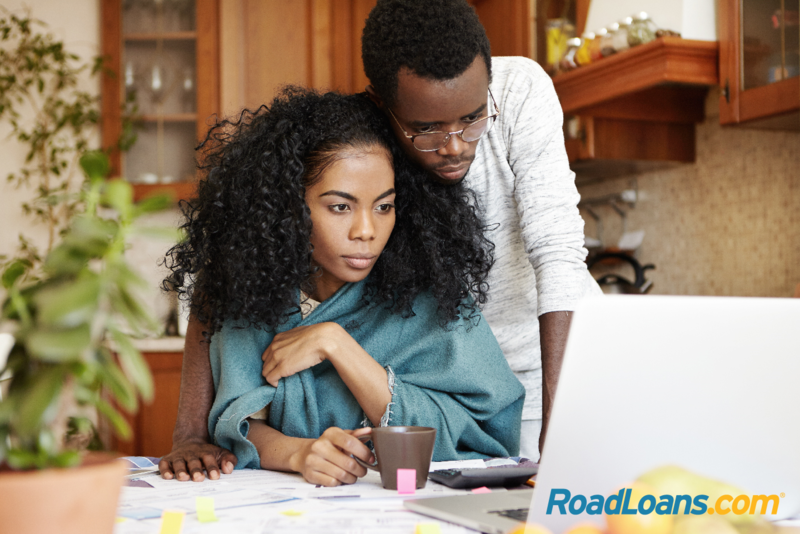 Our affordability calculator enables you to estimate how much you can potentially afford as a total loan amount. Remember there are costs beyond the vehicle sticker price, including sales tax, registration and any add-ons you decide to purchase, like a service contract, that you may want a loan amount to cover. The loan amount might also influence whether you can afford a new or preowned car. To really get the full picture of what a car will cost, think about insurance premiums, fuel expenses and the price of maintenance like oil and tire changes, too. These will all be on top of your monthly car payments and may affect what type of car you decide on, whether a full-size SUV or a smaller sedan, for example. With an idea of what’s affordable, you’ll want to get the best deal on both financing and the vehicle. Apply for preapproval before you shop, recommends the Consumer Financial Protection Bureau. Arranging financing before visiting the dealership enables approved applicants to compare loan offers at their leisure, choose the best option, then focus on selecting the right model and negotiating price when they get there. At RoadLoans, the online lending platform of Santander Consumer USA, you can apply for a car loan in minutes and get an instant decision. If approved, take your loan documents to the preferred dealership listed inside, or choose another with our dealer locator, and shop like a cash buyer already knowing how much you have to spend and the terms of your loan. We work with a national network of dealers able to show customers select new and used models meeting our standards for age, mileage and financing, so you can buy with confidence. Knowing the average car payment provides useful context when thinking about financing your next vehicle, but it’s also helpful to budget what you may be able to afford. Planning ahead gives you a better chance of securing a comfortable payment and paying off your car with no hassles along the way.